This year Clare Waight Keller, an English-born designer. was hired by Philippe Fortunato, chief executive of Givenchy, to become the first woman to hold the position of Artistic Director of women’s and men” ready-to-wear, haute couture and accessory collections. Hubert de Givenchy was a student of the Beaux-Arts, studying and working with other famous designers at a time when noted fashion houses used their designs as property of the “company”. Young designers , in order to gain recognition, began creating collections of their own and showing their collections at various venues much smaller in scale than the lavish “fashion week” showings offered by the “big” houses. In 1952 Givenchy founded and launched a collection called “Les Separables”, the first designer to create luxury ready-to-wear. 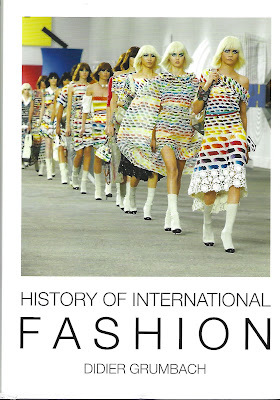 The collection received great acclaim from sources such as Vogue, NY times and Album du Figaro. 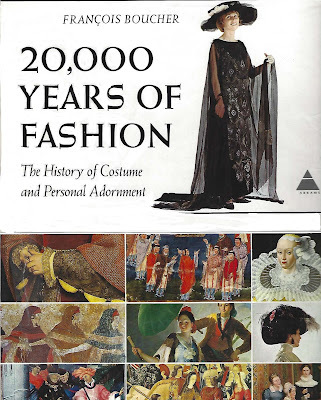 It was at this time when middle class buyers were demanding high quality and the same fashion aesthetic accorded to couture clothing, which was, of course, sold at a much greater price point. 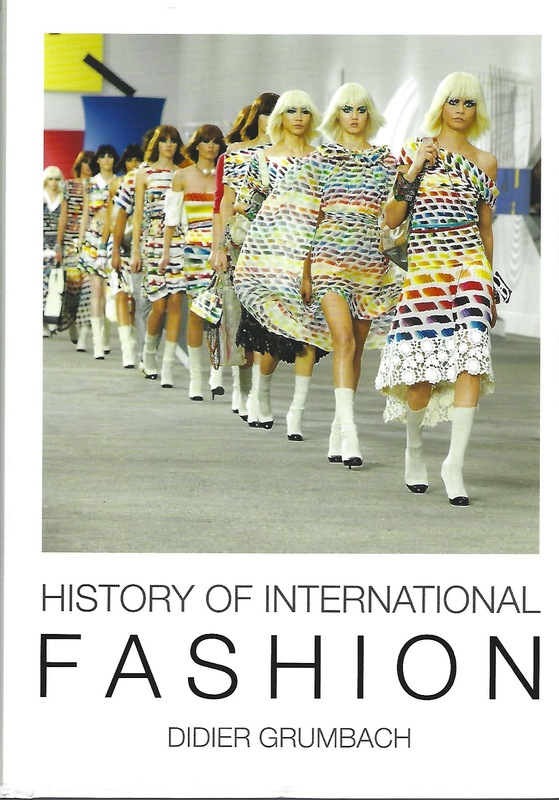 Realizing the potential of this new purchasing market would change the face of international fashion as it was known at the time. Fashion houses were being combined under the auspices of financial entrepreneurs, commonly called “kings”, and the pressure was now profit driven. In 1969 the House of Givenchy developed a fashion line for men and further diversified with shoes, jewelry, table wear and upholstery and in !976 established their flagship store in New York on 5th Avenue. In 1988 Givenchy joined the powerful and influential LVMH (Louis Vitton, Moet and Hensley). Hubert retired from the company in 1995. 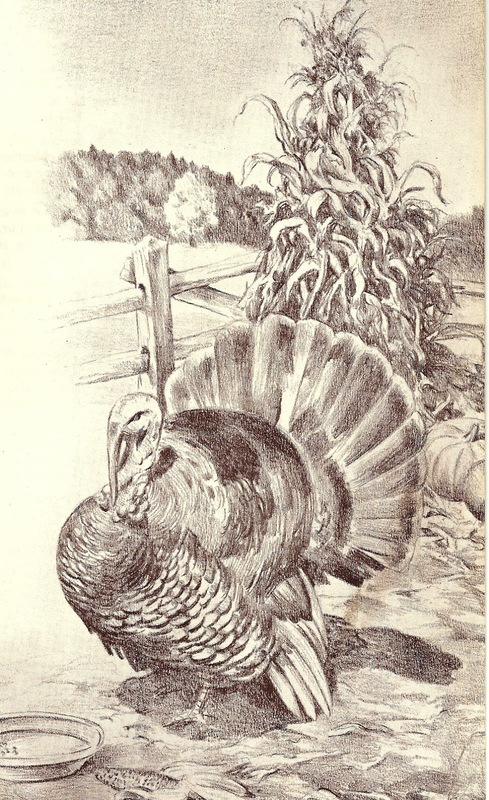 This week in the US we celebrate Thanksgiving Day. 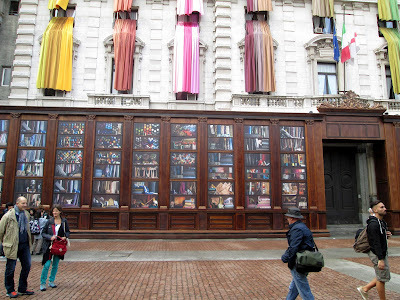 While we were in Milan ( see my blog on Milan fashion week) wandering and window shopping I spied the most awesome store front in the plaza across from the famous La Scala Opera House. The first floor of a block-long building showed the interior of a high-end haberdashery shop. Through the windows the public could see stacks of fabrics, masses of buttons, zippers and all manner of sewing accessories. This display was so realistic that many people tried to enter the building. I admit, I would have spent days and days within. But, of course, none of this wonderment was real. 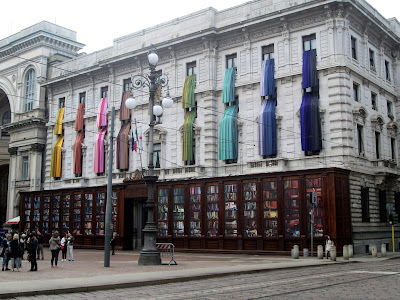 It was the most clever façade celebrating Italian design. 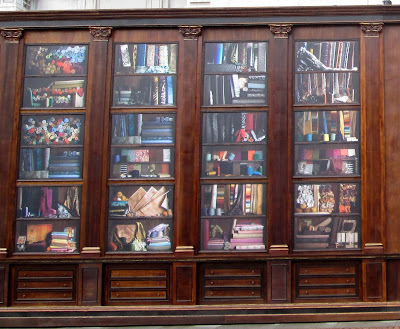 There were other public displays to be found around the city featuring design in many areas. This is another Italian Design display found in the Galleria Vittorio Emanuele II. This ornate shopping arcade has a floor plan on the shape of a Latin cross. Mosaics represent the continents of Asia, Europe, America and Africa and the glass and metal ceiling was the first in Italy to be structural rather than merely decorative. 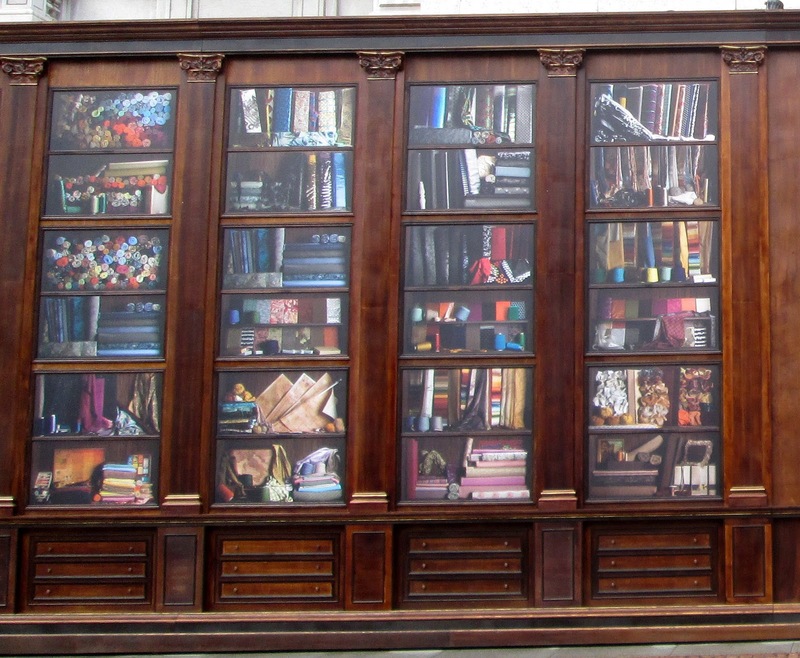 This display, in front of the Prada flagship store, featured Italy’s great reputation as jewelers to the world. 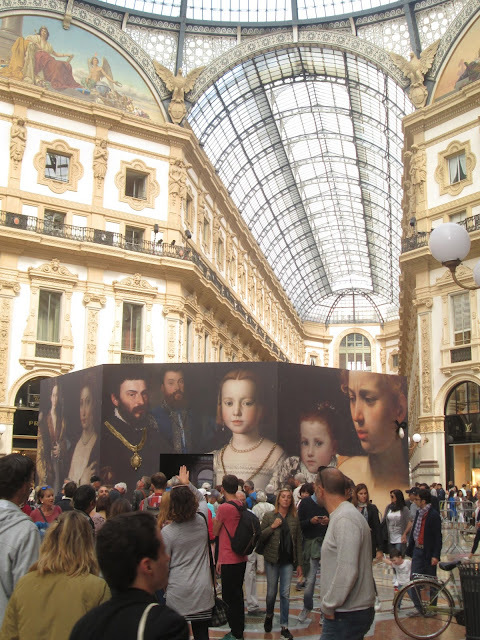 Renaissance figures adorned billboard-sized panels, dressed in finery, and, of course, their fabulous jewels. The jewels were showcased in three dimensions . You just never know what you might encounter. We recently returned from a short trip to Italy, beginning with Milan during Fashion Week. 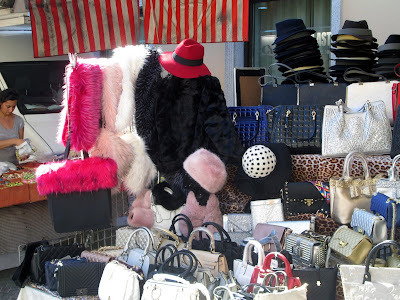 Milan, capital of the Lombardy region in northern Italy which stretches from the Alps bordering Switzerland to the flat plain of the river Po, is both the financial and fashion capital of Italy. A fashion design rival of both New York and Paris, Milan hosted more than 60 fashion shows and more than 80 presentations with 800 showrooms throughout the city. “This is an Italian city of progress and change” stated “King” Giorgio Armani. Before a glimpse at the fashions for spring, 2028, let’s take a walk through the so-called “fashion quadrilateral” ( Via Montenapoleone, Via della Spiga, Via Manzoni. And Via sant’Andrea). Flagship stores from Armani to Versache along with many independent boutiques offer a window-shoppers dream. 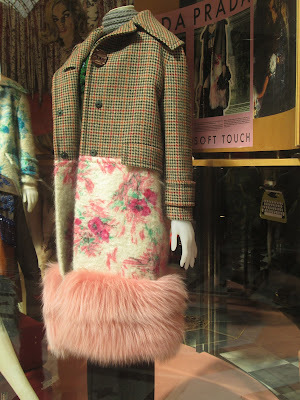 The one word I thought of as I viewed the fall and winter displays was “texture”. 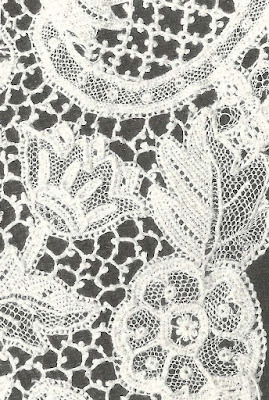 Designs were often of several fabrics, heavily textured (some bulky). The addition of animal furs ( and hair) both faux and real added additional layers which, at times appeared to be in their natural state. Long rovings of slightly curly fleece-like material hung from the waist or hem of garments. 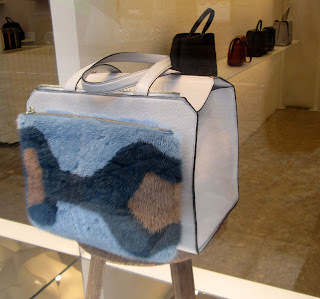 (I called this the “wet English sheep-dog look”) Other trimmings were fine textured, obviously synthetic and highly colored, Even handbags could not escape this furry look. But you did not have to spend your Euros in the up-scale establishments, as the market stalls offered much cheaper versions. The promise of Spring was similar but slightly more refined. Plaids and checks from head to toe and multicolored jackets worn with cowboy boots. But there was also shimmer and glitz with Armani’s shiny black suits and iridescent fabrics from Gucci. But fear not, fringe was still shown , now floating on the hemline of long dresses. Though those of us who do not walk the red carpets , do not greet heads of state, nor jet around the world with valets to care for their wardrobes can still appreciate these outpourings of fashion creativity. The “trickle-down effect” soon reaches the ready-to-wear consumers and don’t we all want to be in fashion? On the outside of the patio door to my office is a huge spider web. I would say about 18 inches in diameter and tethered to various hanging baskets. The spider responsible is an enormous orange garden spider who appears occasionally in the center of the web, otherwise I don’t know where it resides, which, I admit makes me nervous when I’m outside. I don’t like spiders at all, but “Goldie” is living outside and her web is so delicate and intricate that I find myself looking at it often. 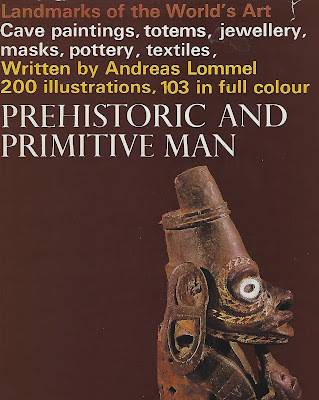 Many years ago I was writing an introductory course on Textile History (Textiles 101, if you will) and prepared a lecture on little-known animal fibers. Several animals produce silk filaments, of course Bombyx mori is the most notable, but certain mollusks, insects, as well as my “unfriends” the arachnids. According to the Roman poet, Ovid, Arachne was widely noted for her weaving skills and challenged the goddess Athena to a contest, which, apparently she won hands-down. Now Athena was never known to be a gracious loser and in a rage of envy destroyed Arachne’s beautiful tapestry. In despair, Arachne tried to hang herself , but was transformed by Athena into a spider. As silk producers, arachnids ( nearly 300 million years ago) far preceded the silk “worm”. The physical properties are very impressive. Different species produce silk of varying characteristics. Spider attachment discs are made of a strong glue to secure the draglines and framelines. 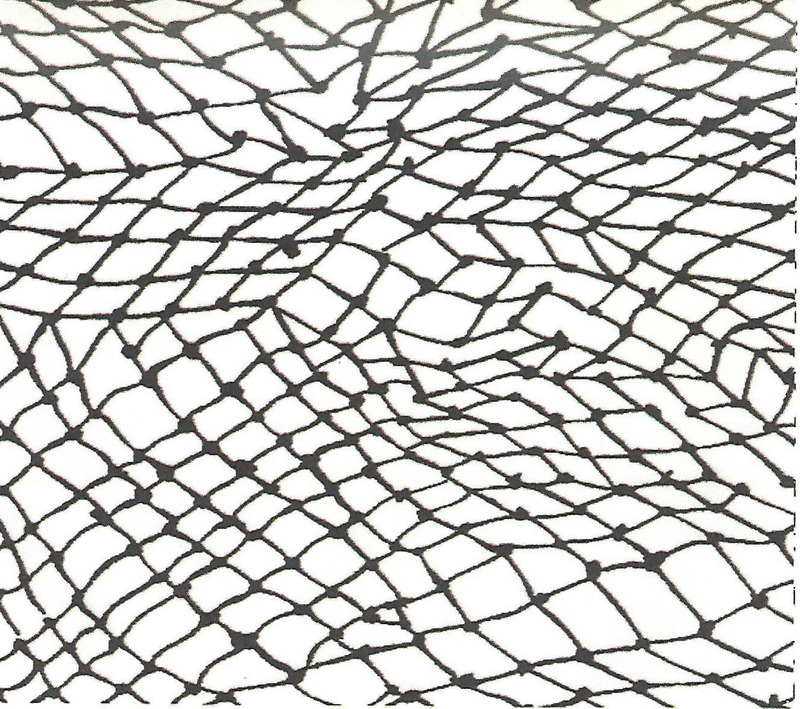 Certain species produce a dragline silk that is stronger by weight to steel, surpassing Kevlar. This excellent tensile strength has been suggested that a pencil thick strand of silk could stop a 747 in flight., and its elasticity is superior to Nylon. Some silks are good insulators, while some absorb water, and some are water resistant. The reason insects, when in contact with a web, cannot escape their demise is as special silken thread called “cribellate” which forms a fine sticky mat combed atop the more substantial silk tract. Historically, several cultures have used spider silk medicinally , as well as for fishing nets There have been attempts to use the silk for textiles in the early 1700’s but the care of the living spiders proved too difficult. Speaking of difficult, in the 1800’s spider silk was reeled directly from harnessed spiders. The military has long investigated spider silk for strong lightweight materials. 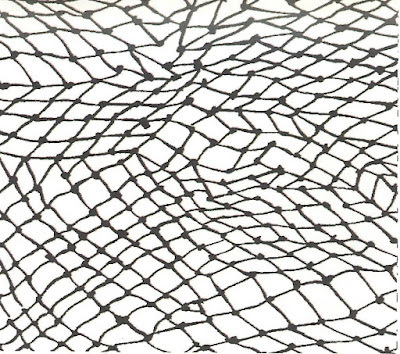 DuPont’s advertisement in the Scientific American of July 1996 tells that they were studying these biopolymer structures of spider webs by using recombinant DNA technology. I had not heard more about this research until several years ago while attending a Textile Society conference, I met a retired chemist who had worked for DuPont. She told me a fellow chemist had resurrected these studies. So maybe, we shall see spider filament for use in textiles. For me, a spider silk sweater, NO WAY!!!! 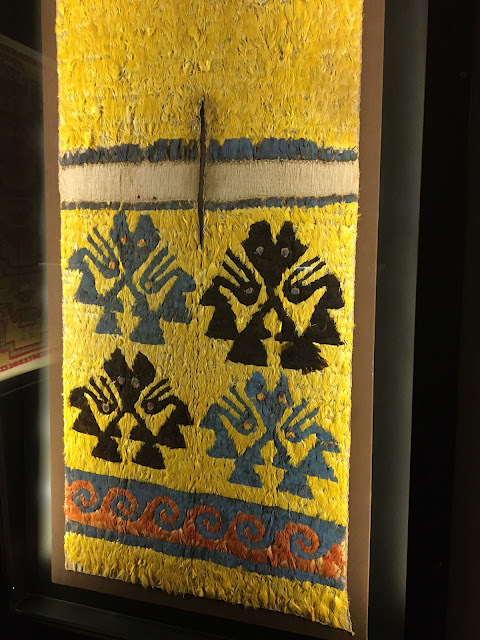 After visiting the Amaco museum of pre-Columbian Peruvian textiles in January (See my blog Textile Treasure of Ancient Peru, 2/19/17) I was inspired to do more research on the cultures of ancient Peru. Here are only a few of references I am using. There is also much information available on the internet. 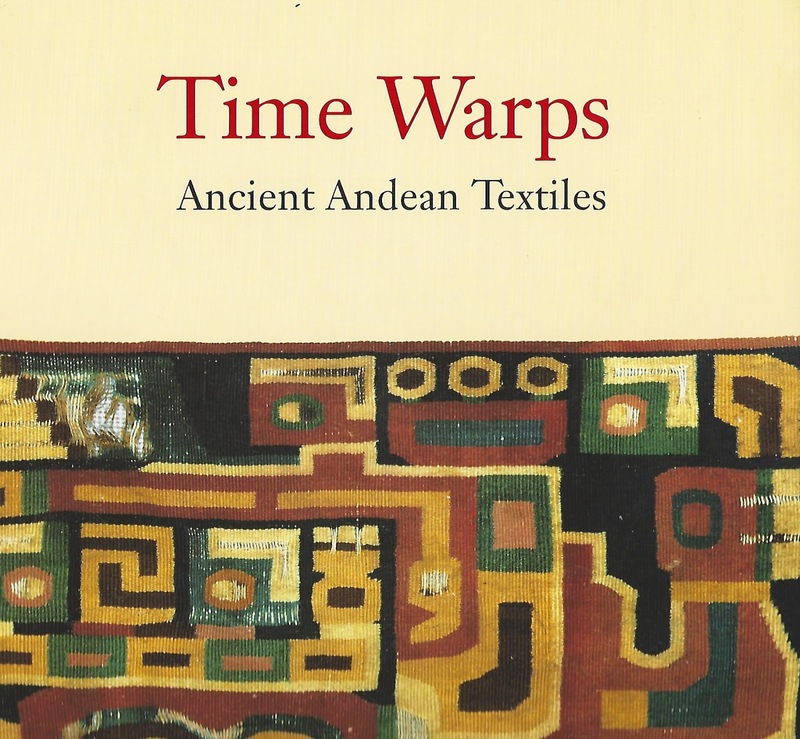 The images of textiles created thousands of years ago by these peoples is truly inspiring. 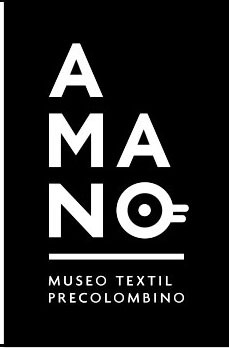 For many years I have been asked to present lectures on various textile topics. One of my very favorite topics I will share with you over several months : Magic Clothes of Power. I once had read a book by Barbara Michaels about a “bad” quilt. It was not poorly constructed, not green and purple and orange, it was EVIL. 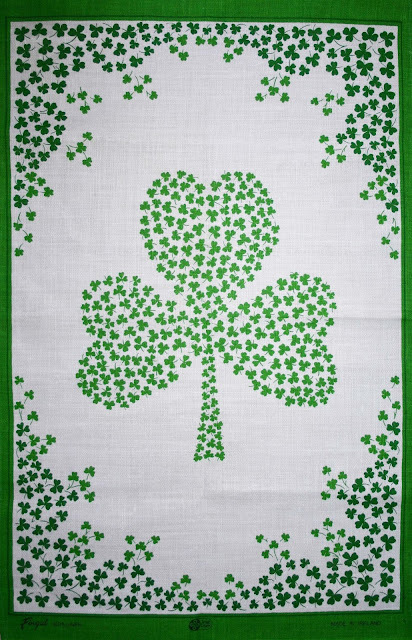 and very dire consequences befell anyone who came to be associated with this textile. 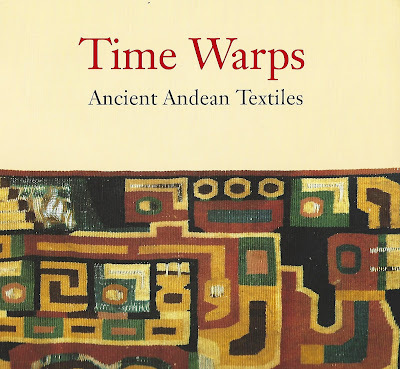 So I began gathering stories and information about textiles that had intrinsic powers. Not represented power, such as flags or military uniforms, but possessed actual , beyond the norm, abilities. Folklore and literature abound with these legends. However there are equally as many accounts of peoples and cultures that, today, believe that certain textiles have been empowered in some way either by their creator, or the fibers and materials used in their manufacture, or by some divine intervention. Today, I go to literature for such an account: “Wild Swans”, Denmark, Hans Christian Anderson. 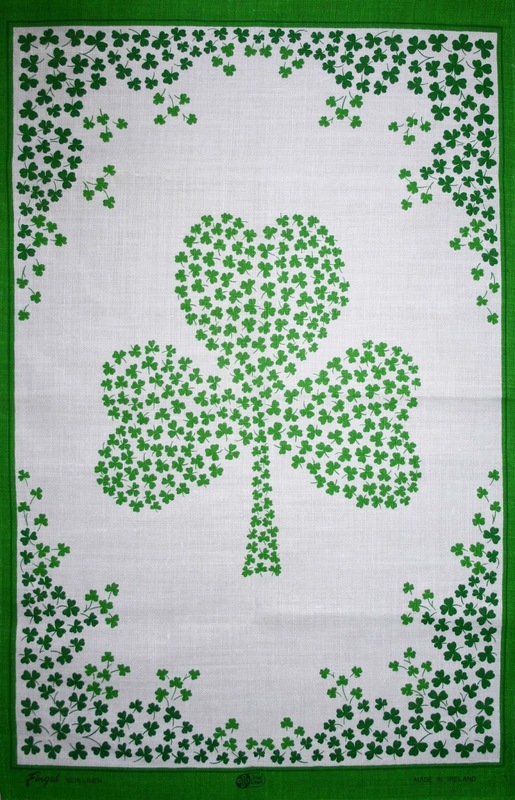 In this story, a beautiful princess weaves shirts made from the fibers of the stinging nettle plant for her 11 brothers. It seems that their evil stepmother had cast a spell upon the boys, turning them into wild swans. A good witch told the princess the completed shirts, when worn by her brothers, would turn them from swans back into young men again. These wonderfully soft shirts made of something so unlikely could reverse magical spells and would endow their wearers with magical powers. And so it was. There is, usually, in the background of such stories a grain of truth. 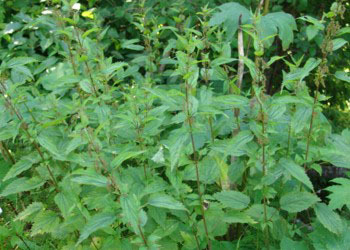 In this case, it is the fiber of the nettle plant. Stinging nettle – Urtica dioica, is a herbaceous perennial 1-2 meters in height, found abundantly in boggy areas in northern Europe and Asia, less commonly found in Canada and US. The underside of the leaves are found with slender hairs containing several toxic chemicals which are released when brushed against causing itching and pain. 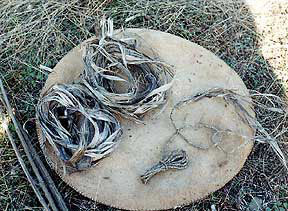 The textile fiber is a bast fiber found in the stem and is processed like flax.into very soft , supple fabric. 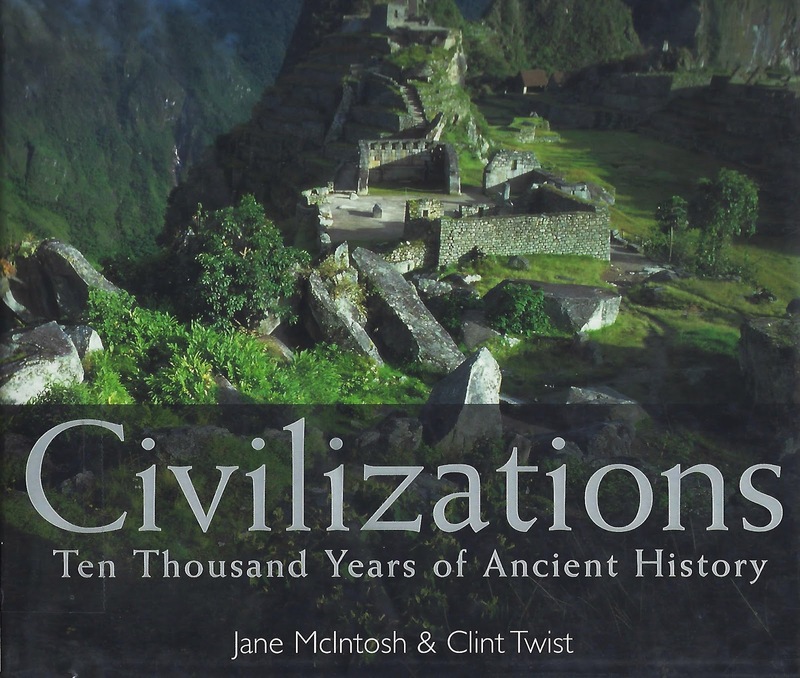 Nettle, which was still used in northern, central and eastern Europe well into the 20th C, was found in a tomb in Denmark dating to 1,000 BCE. 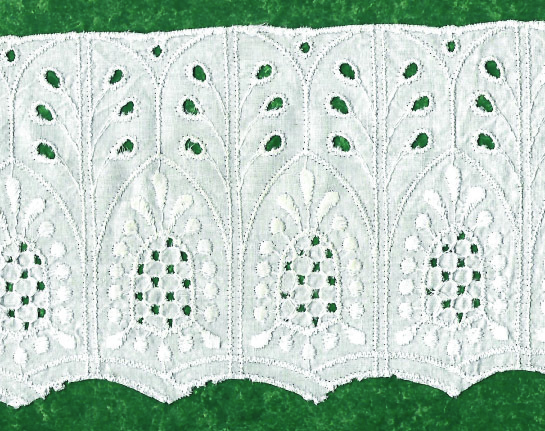 White fibers originally believed to be flax by archeologists were later shown to be nettle. When Germany and Austria ran short of cotton during the war, the value of nettle was recognized and 2 species were chosen for textiles. 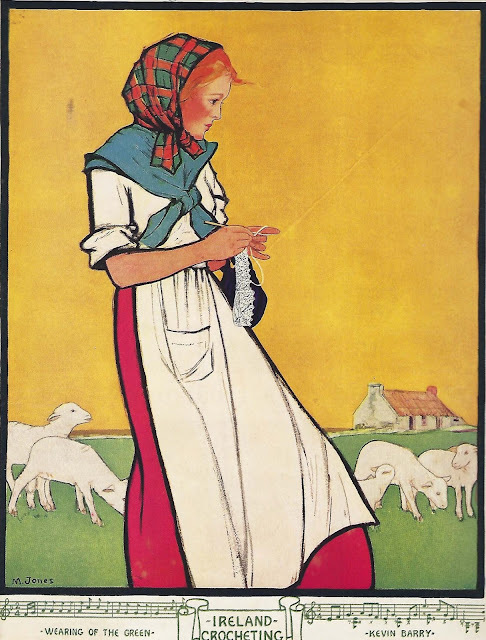 It is estimated that Germany harvested over two thousand tons of wild nettles to weave fabric for their shoulders. Several years age, my husband and I were dining in a restaurant in Istanbul which served us steamed nettle, apparently the toxins are eliminated by cooking. Frankly , it tasted much like any cooked green. 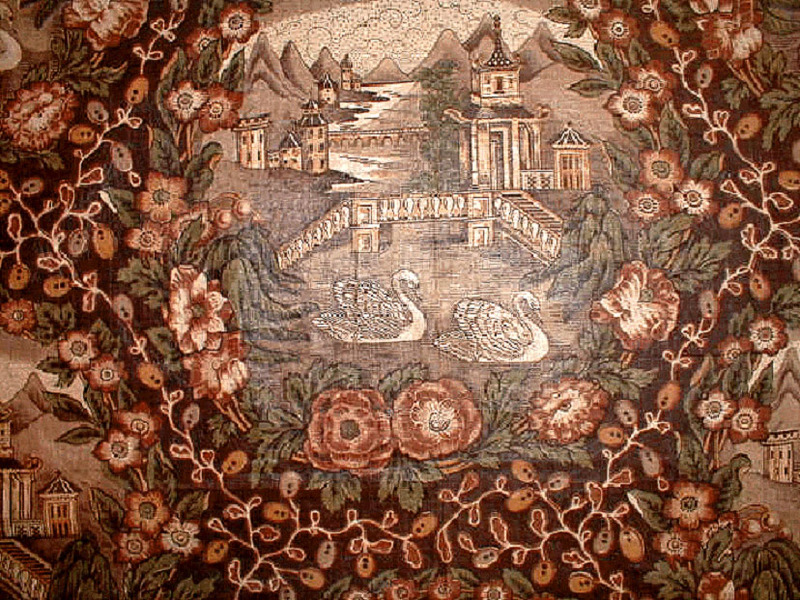 I will share more of these textile tales in upcoming blogs. Eyelet fabric can be described as a combination of lace and embroidery. It can be found in a variety of patterns which cover the fabric surface from selvage to selvage. Usually produced in white but occasionally it can be found in colors. 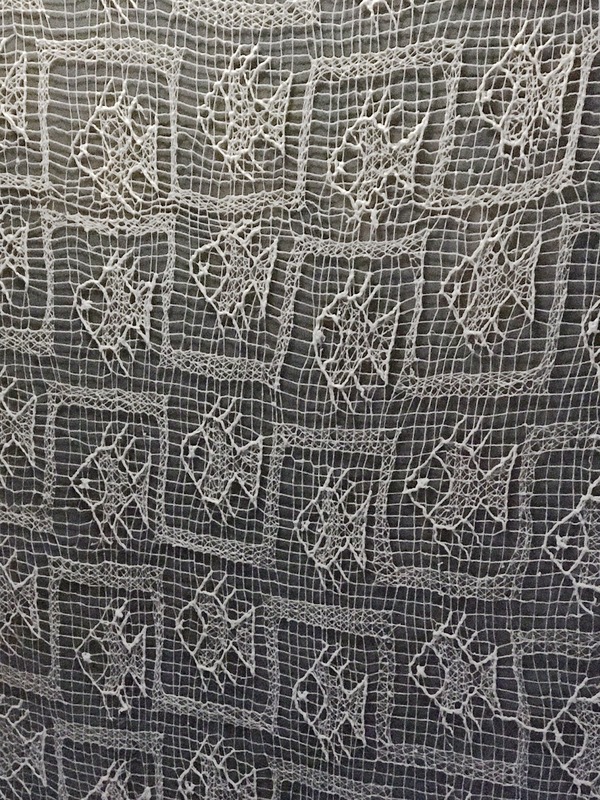 The design is punched into the fabric ground by a series of knives called bohers. The “hole is then stitched to prevent fraying. In the 1860’s an early hand-operated embroidery machine was developed, subsequently, a 24 needle machine was produce which could be powered by hand or electricity.. This machine was known as the “schiffli”, German for boat. 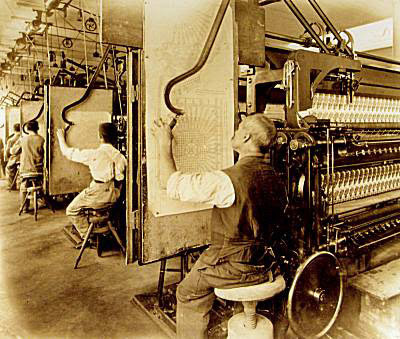 Programs were written in punch paper( somewhat similar to Jacqard weaving and computer punch cards). Early schiffli machine circa 1910. Note the machine operator is following the punch pattern. Today a modern schiffli machine is 65 feet long and 16 feet high, containing 1,020 needles.. 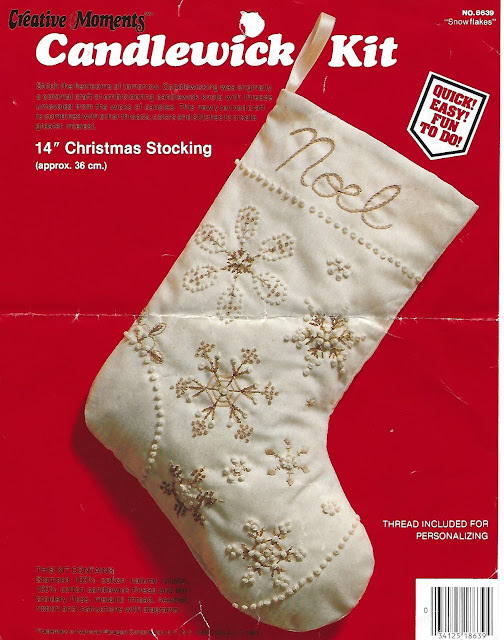 Most manufacturers in the US using these embroidery machines are in New Jersey. These machines are computer run. I love textile embellishments: embroidery, beading, appliqué. I greatly admire those superior crafts-persons who produce these exciting, artistic creations which add so much aesthetic value. This year, 2017, marks the 250th anniversary of one of the most prestigious embroidery firms, Hand and Lock of London. 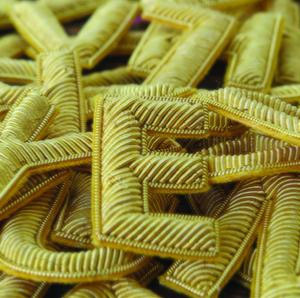 Their history tells of their initial services to the military for badges and embellishments for uniforms. Today they offer their exquisite talents to the Royal House and Family, international fashion houses, designers of costume for theater and television. You can read more of their story on their web page. Hand and Lock also offers educational opportunities, with courses and workshops in beading, goldwork and other embroideries, worldwide. 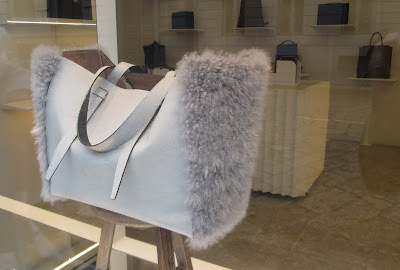 If you are in London you may visit the atelier and view archival pieces and embroidery samples. 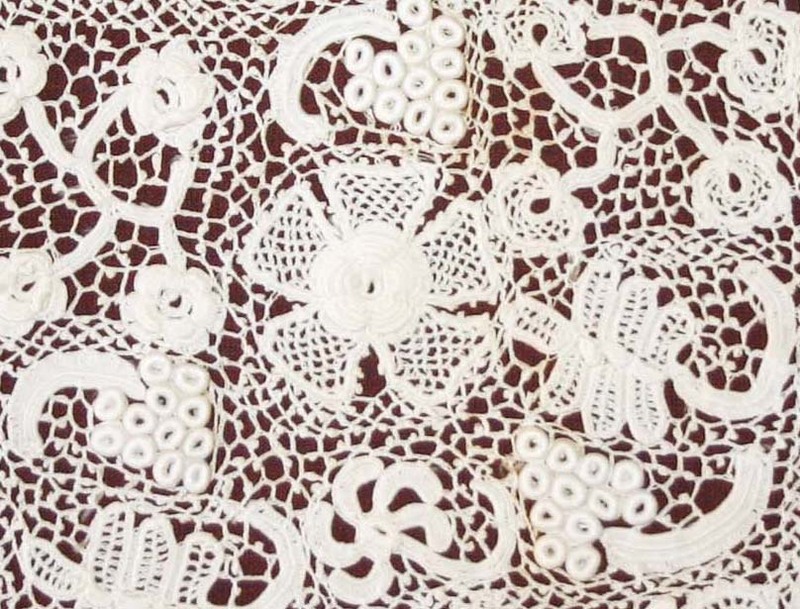 They also have a large assortment of laces and designs, appliqués, embroidery tools and kits available from their on-line shop. I would love some gold-work letters. I can see my initials on an evening bag or made into a small broach. Too often we are blinded by the bling of our culture. For some reason . perhaps a trait of our competitive human nature, we feel compelled to strive for stature by obtaining objects, many of which are “only for show”. This results in over-extended finances and households brimming with unappreciated “stuff”. 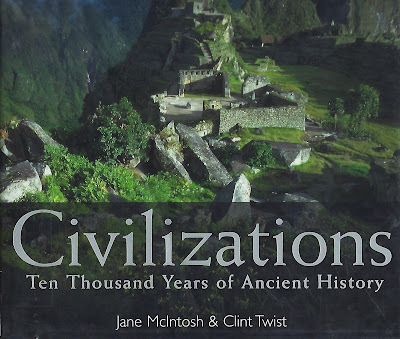 Undoubtedly, there are many examples of outstanding articles : luxury cars (that I would be fearful to drive), crown-worthy jewelry (that I would be uneasy to wear) and medieval manuscripts ( that I could only touch wearing gloves and would not understand the language at any rate). 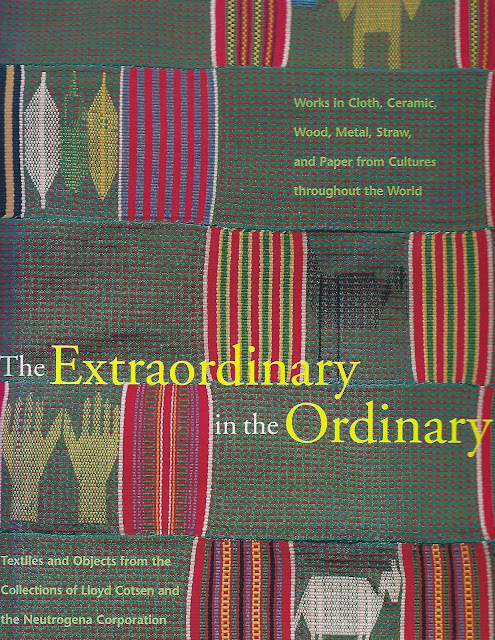 These extraordinary objects have much merit, of course, however, they are eclipsed, in my opinion, by those I can touch, admire and appreciate within my lifestyle. The most frequently asked question I receive when asked to identify a textile is:”What is it worth?” My answer is always the same: “It is worth what someone is willing to pay for it, nothing more” There is a difference between worth and value. One might value a family keepsake, its “worth” may be negligible. These thoughts are the result of my learning of the death of one of my favorite people: Lloyd Cotsen, (1920-2017). I was not a family friend, nor had I ever met the man, but he had a passion, a passion for the everyday, the little things that told a story. He was a man I could relate with, at least in a small way.. Cotsen was a collector..of many, many things. 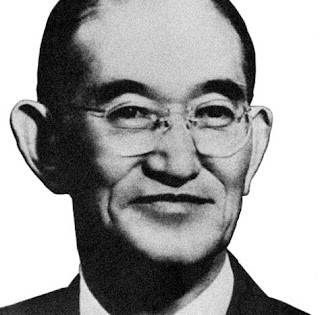 An outstanding business man, he was CEO of Neutrogena and marketed the brand to every dermatologist and into most households. His business successes enabled him to financially add to his collections. 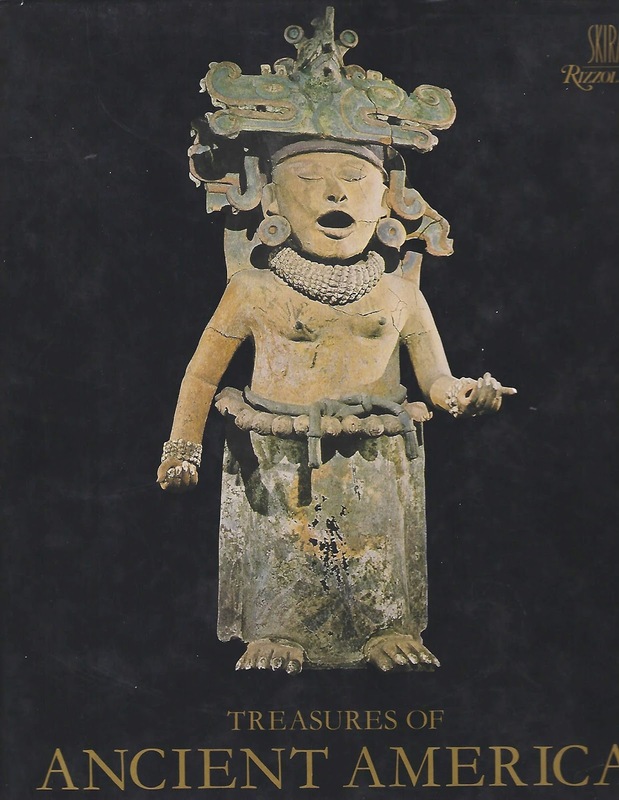 However, his collections were of a broad interest and a result of a lifetime study of archeology. He was also a great philanthropist and a benefactor to many museums. 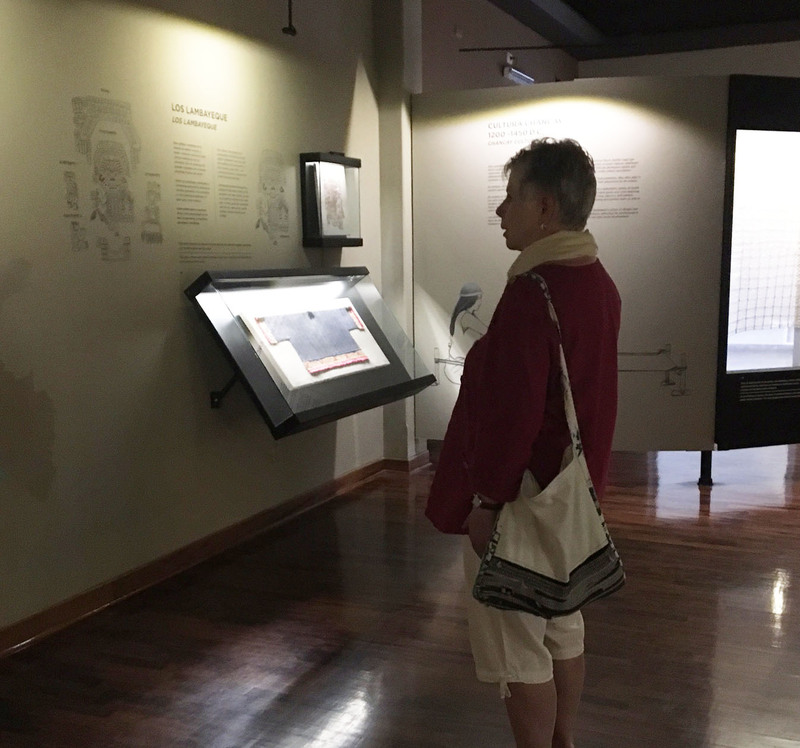 His donation to the Asian Art Museum of San Francisco consisted of Japanese bamboo baskets, to the Firestone Library at Princeton his collection of more than 40,000 children’s books. 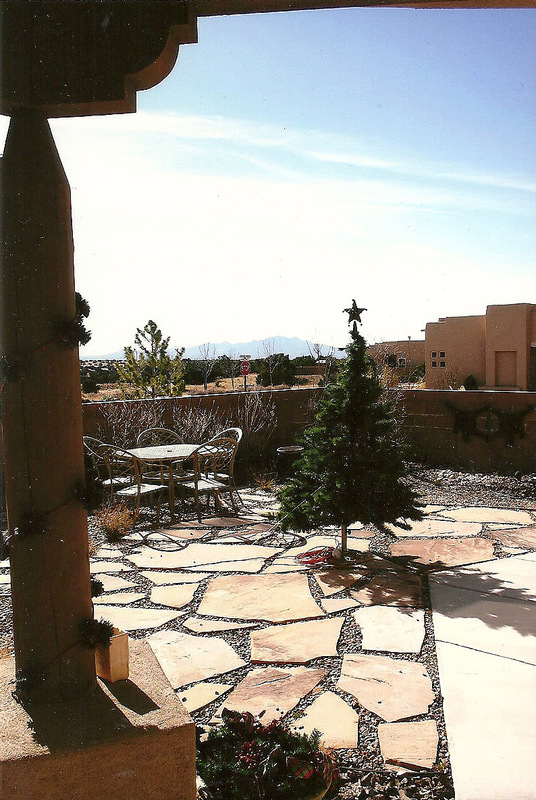 To us in Santa Fe he is very highly regarded for his contribution of over 3,000 articles from his collections to the International Folk Art Museum and the endowment funds which provide support to the museum. This very varied accumulation of articles include many textiles ( an arctic parka of walrus gut, as an example). It might be a worthy exercise to follow Cotsen’s ability to see the “extraordinary in the ordinary”. This is one of my most favorite of all the books in my reference collection. 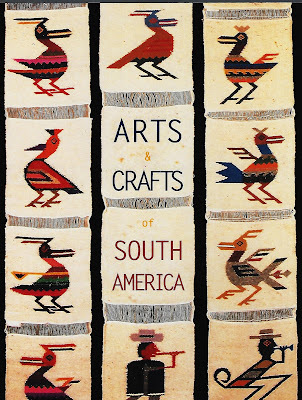 The text is informative, the photographs beautifully printed and the scope of Cotsen's collection is outstanding. I recently read an internet article “A much needed primer on cultural appropriation”. So, what does “appropriate” mean? According to the dictionary the word appropriate means to take as ones own, to take for ones own: hence to steal. We are all familiar that taking an invention protected by patent is fraudulent. Using another’s words either orally or in print is plagiarism. However, it becomes more murky when we speak of intellectual properties or cultural values. 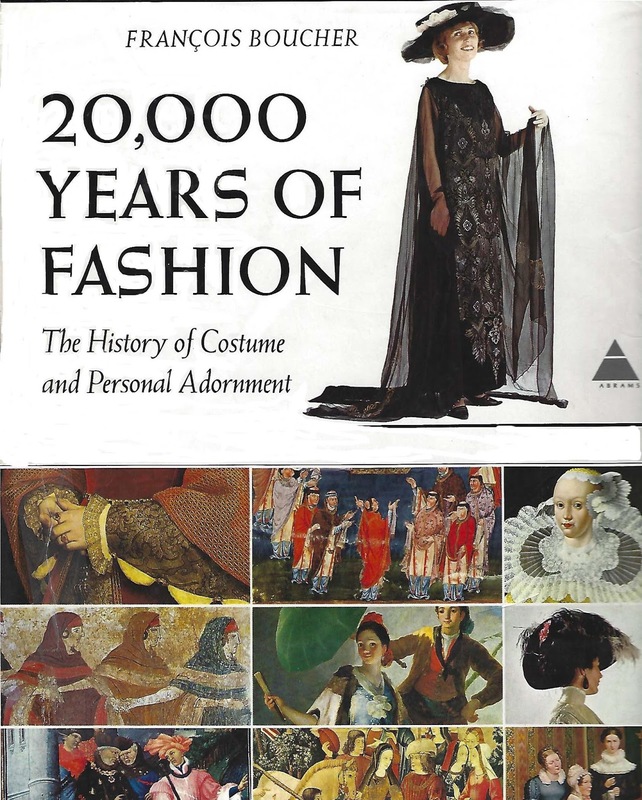 The reason I was intrigued by this article is that it addressed the issue of fashion and designers that have (and are) using cultural references in their designs with little appreciation to their true significance. There has always been the idea that design (in whatever form) is derivative, that is, it is based upon previous concepts , sometimes very explicit references, sometimes only a vague hint of a precursor. In Textile Designs (Meller and Elffers, Abrams, 1991) the authors state “…the recycling wheel, which sets the motif of textile designs on a circular road of eternal return. Nothing disappears, and nothing appears out of nowhere.” This might be taken to imply certain permission to copy. But this is not what I am talking about in appropriation of culture. Certainly we are seeing in the past few years a return to mid-century style, design and color patterns. Cultural appropriation is very different. It is taking the values and beliefs of a people, their physical characteristics and/or lifestyle. It is removing these symbols from their original context and using them in fashion , let’s be real here, for a profit. The meaning of these cultural references is nowhere addressed, and, indeed often far, far removed from any original significance. This is not a new problem. In the 1950’s there was great interest in so-called “ethnic” designs. Yards of printed fabric presented Mexican senores in sombreros asleep beneath palms or with burros and senoritas with baskets of flowers. There were “Little Black Sambo” pajamas and “Aunt Jemima” aprons. Today this is not only considered sooo politically incorrect, but down-right inflammatory. And yet today it continues with many ethnic groups. Today, we take technology as a given. New advances are made daily, increasing the productivity of our endeavors. These advances are exponential, not linear. By this I mean the tech wizards do not rely on a step-by-step method of discovery and advancement (starting from the beginning every time) but rather on the entire “mass” of information available. Because we are so demanding of immediate advances ( new cell phone technology is a great example) we forget the difficulties encountered in the past by the pioneers of mechanization, the tinkerers and the inventors. 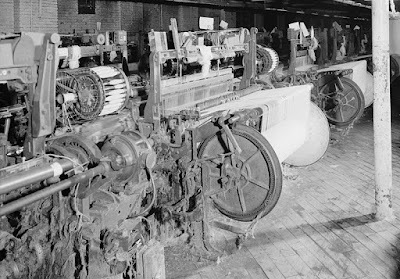 When the Draper Corporation ceased making power looms for textile production in the mid 1970’s, it had been in operation for over 130 years in Hopedale MA, and was once the largest maker of power looms. Ira Draper was a wealthy farmer from Weston Massachusetts with an ability to improve heavy machinery, making it more efficient. 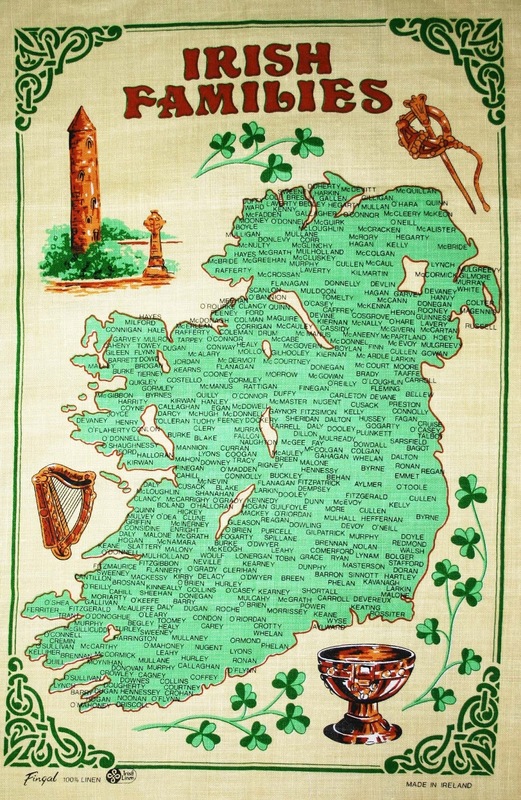 His great-great-grandfather, from Boston, was one of the first of the colonists to begin a business weaving and selling cloth, so textile production was an interesting pursuit for Ira. In 1816 he obtained a patent for an improved flyshuttle hand loom and the first self-acting temple. The loom temple was a moving device allowing the weaver to manage 2 power looms at the same time In 1829 he received a patent for an improved version off his original design and later sold his patents and the business to his son, James. Ebenezer Draper bought the business from his brother, James, and in 1853 another brother, George, joined the firm of E.D.& George Draper. 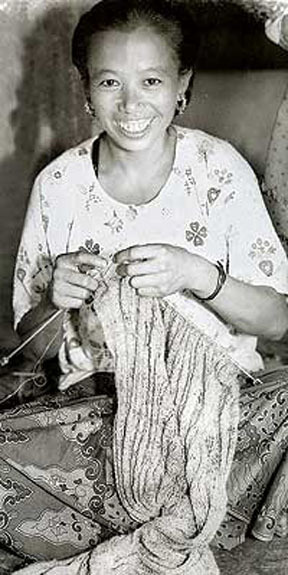 Over the years, he created dozens of variations of the spindle. Following Ebenezer’s retirement in 1868, George directed the company into the developing area of Ring Spinning. By 1887 the company owned patents of 12 varieties of ring spindles. There are two methods of spinning Mule spinning and Ring spinning. Mule is a type of spinning frame with an intermittent action. It was used to a considerable extent for spinning wool, but only in limited usage in this country for cotton. 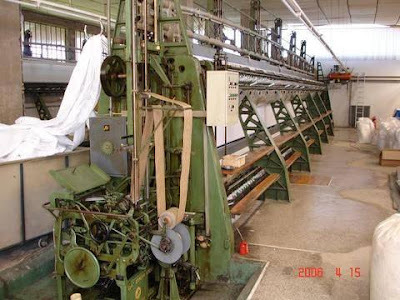 Ring spinning takes place on a ring frame which drafts the roving, twists the yarn and winds it on a bobbin simultaneously and continuously, greatly more efficient. Many automated looms had been patented but were found to be impractical and were not used. The Draper brothers decided to redesign and manufacture automated looms. One, the Northrop loom (named after its inventor, James Northrop), was redeveloped, allowing the weaver to run 16 looms at once. In 1895 the Northrop Automated Loom was patented in England, Belgium, Germany, Russia, Austria and Spain, selling over 60,000 looms by 1900. 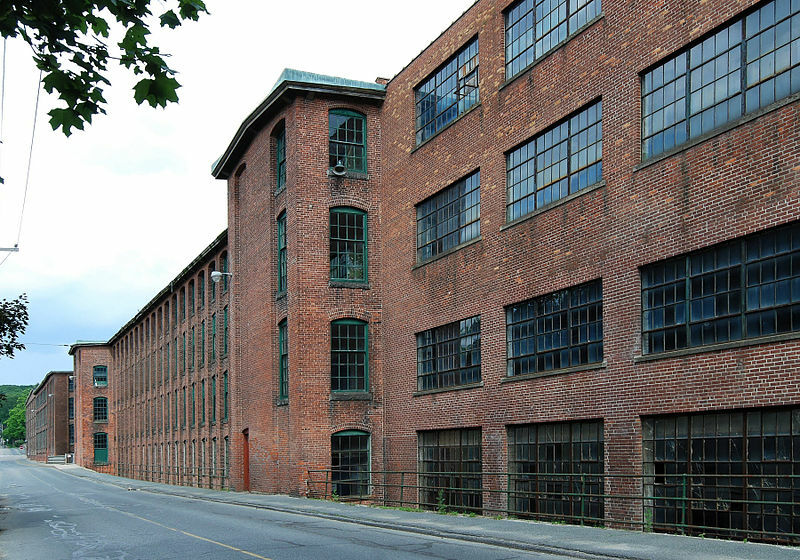 For many decades the Draper Corporation continued to make improvements on their products, selling to southern textile companies after the northern mills had closed. In1967 the company became part of Rockwell International, ceasing production in the mid 1970’s. I am a great admirer of these far-sighted pioneers who through their imaginations and hard work have made incredible advances possible. This weekend we celebrate Easter. For those in the northern hemisphere, Easter is synonymous with Spring! After a long winter season, flowers and trees are blooming, birds are singing. Easter also means bunnies and baskets of candy. Of course, Easter has another meaning . For Christians throughout the world it is the celebration of the Resurrection of Christ following his death by crucifixion as ordered by Pontius Pilate, the Roman prelate. 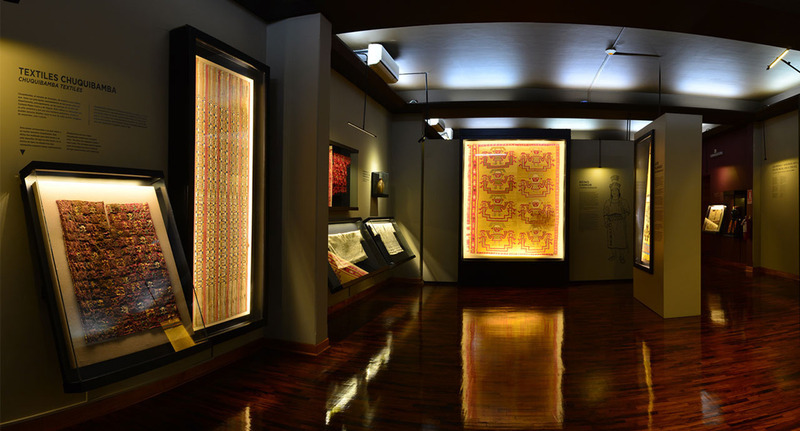 Many believe that certain textiles have intrinsic powers, not merely symbolic, that provide protection or bring good fortune. 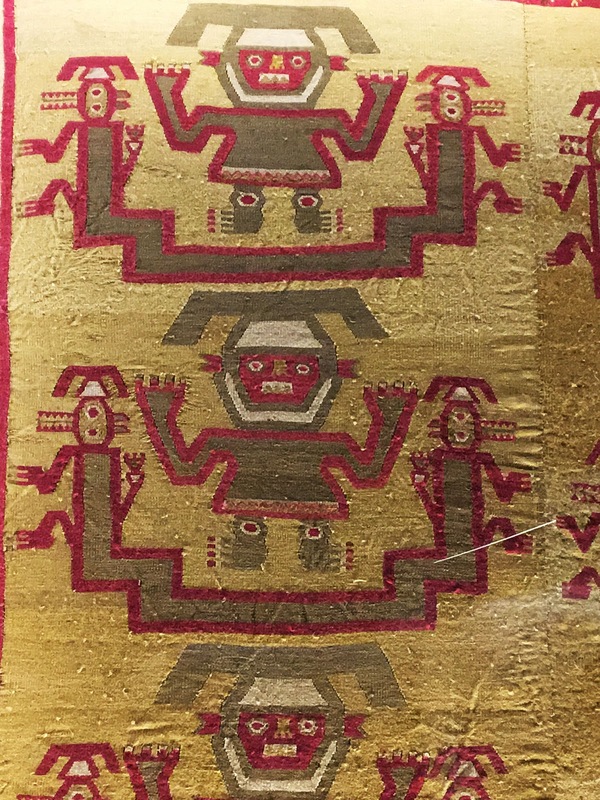 One such textile is the Shroud of Turin. wrote to Jesus asking him to come and cure him of leprosy. Unable to visit, Jesus sent a miraculous self-protrait imbuded with curative power. 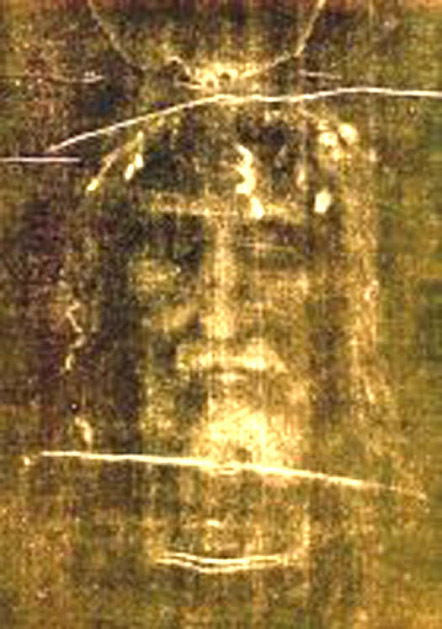 Some equate this story with the Shroud of Turin, however the shroud’s linen cloth bears the image of the entire front and back impressions of an apparently crucified man. There has been controversy on whether this textile is the burial shroud of Jesus Christ or a medieval fabrication. 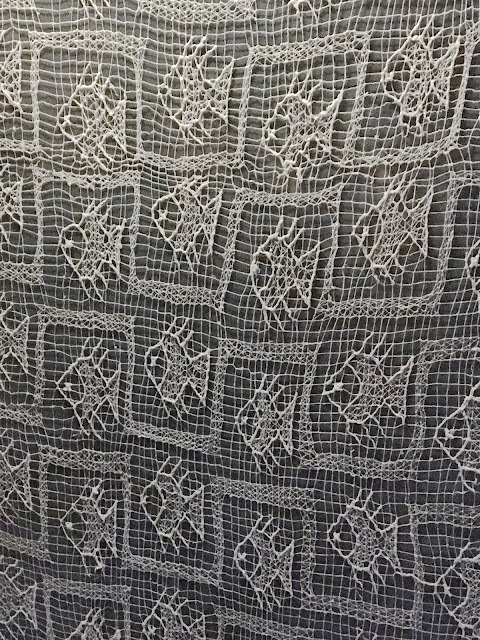 Results of carbon-dating posed the age of this textile to be no older than the 1200’s. Others suggest the actual date cannot be determined due to contamination by centuries of manipulation. 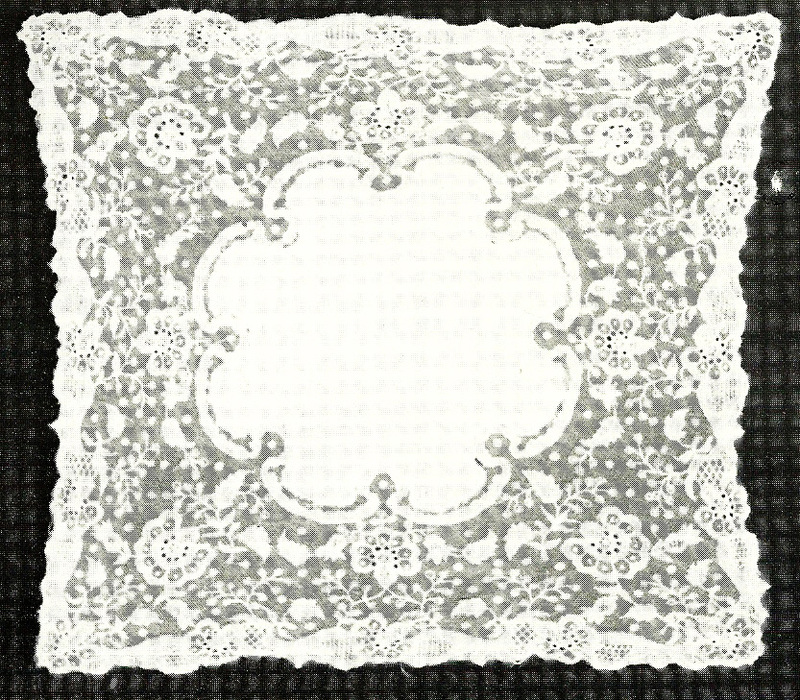 The 14 ½ foot of linen fiber is owned by the pope, but it is in the care of the archdiocese of Turin, Italy. The Catholic Church does not make any claims toward its authenticity and has long acknowledged that there are disagreements and questions that have not been successfully addressed. There are other “miraculous” portraits of Jesus, one of which is known as the Veronica Veil. Veronica, it is said, was a wealthy woman of Jerusalem who witnessed the journey to Golgatha that Christ made with the cross. She wiped his face with her veil and his visage was imprinted upon it. There were many “originals” of the textile and it was assumed that they had been painted, however the legend asserts that the image could duplicate itself miraculously. 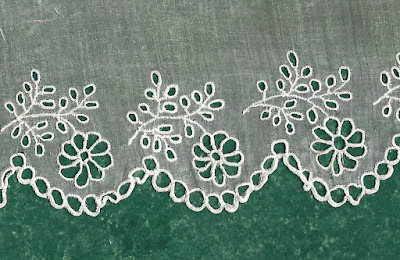 If you are not familiar with this needlework technique, it is understandable as this type of embroidery is not common today. The history of candlewicking goes back to the late 1600’s when Englishwomen embroidered white bedspreads. 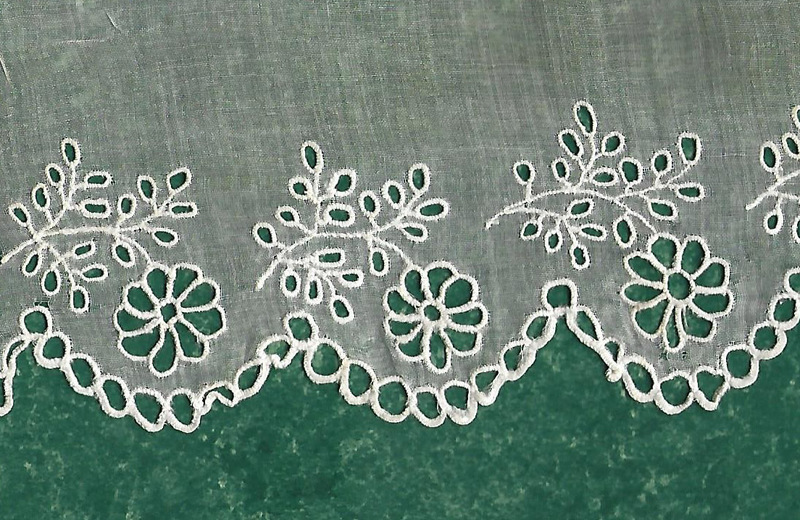 On a twilled woven linen ground they embroidered clustered flowers and fruits in very small French knots. 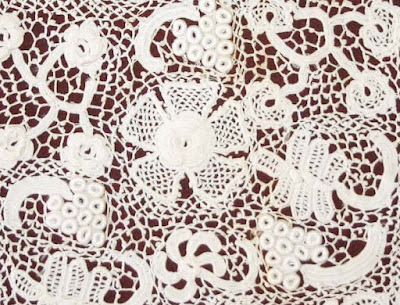 Flowing vines were made from white cord laid and couched. In the late 18thC this knotted worked appeared in America where the white cord was replaced with “wicking” giving it the name “candlewicking”. Wicking is the material used for making fiber to be cut into lengths used for making candle wicks. The early candlewicking was always worked white on white. Vines and clusters of grapes were popular motifs, also sprays and baskets of flowers. For early American candlewicking 4-, 6-, and 8 ply thread was used. The needles were long with a large eye and a wide shaft. 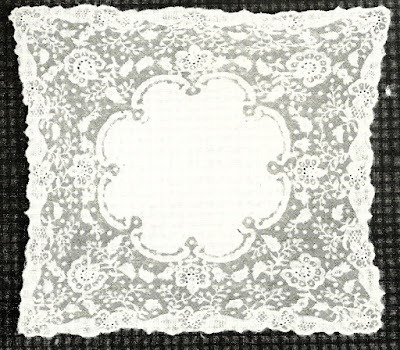 After the embroidery was completed the spread or counterpane was washed to shrink the fabric so that the threads were held in place more firmly. 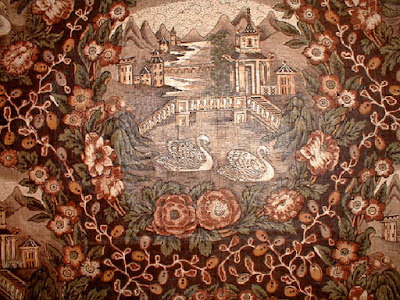 Candlewicked spreads were replaced by the production of tufted chenille. 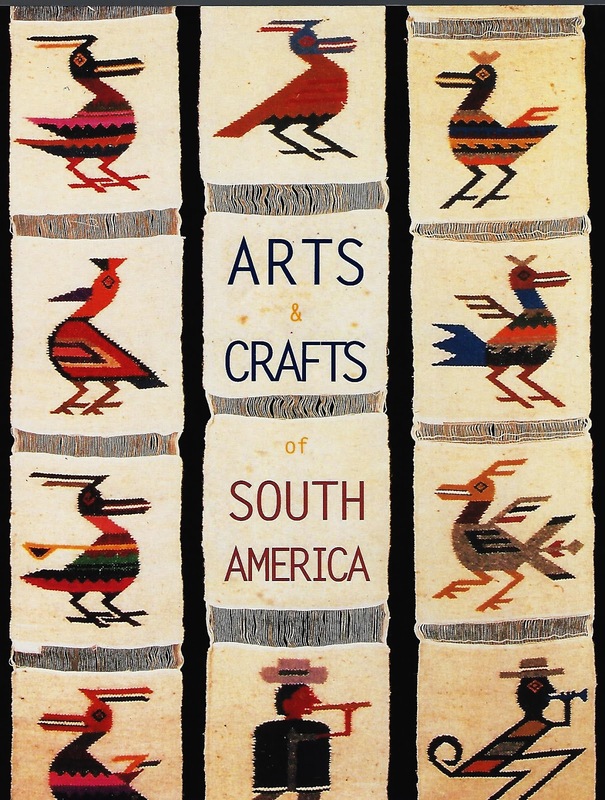 In the late 1970’s there was a limited renewed interest in this handwork, usually for the making of small, decorated items, such as sachets. Kits were available which contained the ground fabric, wicking, needles and a pattern. 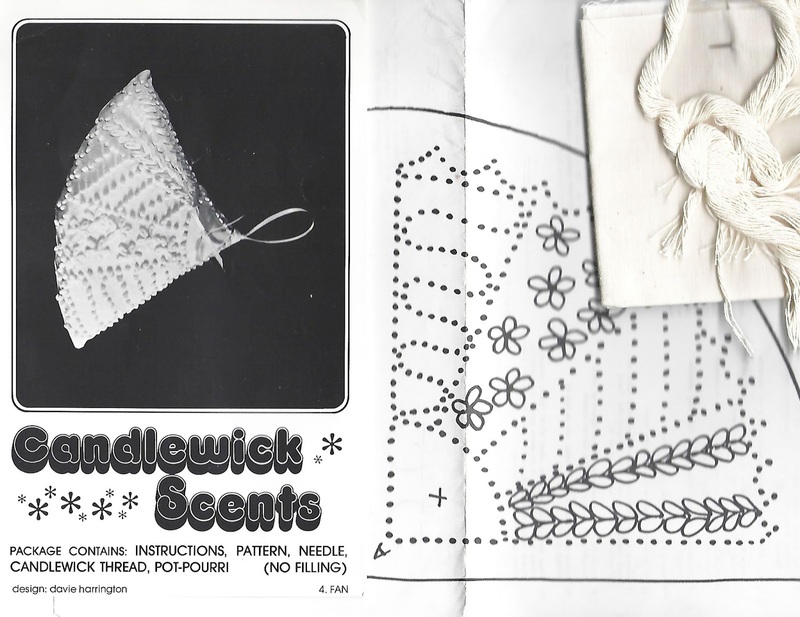 There are many vintage candlewicking kits in new condition available on eBay at very reasonable prices.